Rise & Shine specializes in film set catering. We have been catering on film sets for over 20 years so we know exactly what you need! We love to create custom menus based on your particular needs. If you have any special requests or dietary restrictions please let us know, we are happy to help! Our staff is professional and always sure to arrive on time. Depending on the size of your crew and the service type, we will arrive 30-45 minutes prior to your service time for each meal. Our staff will work quickly and efficiently to ensure timeliness and great service. In addition to film breakfasts and lunches we can also provide drop-off or full service craft services. Depending on the size of your crew and the service type, we will arrive 30-45 minutes prior to your service time for each meal. Our staff will work quickly and efficiently to ensure timeliness and great service. If you have any special requests or dietary restrictions please let us know 48 hours prior to service. Tables are not included. 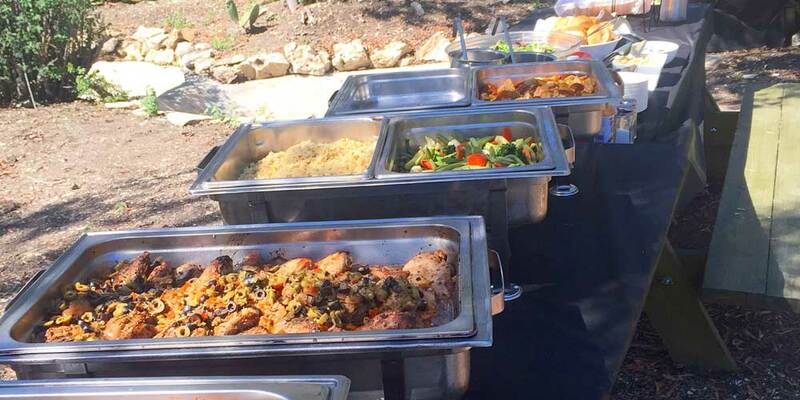 You will need to provide 3 – 6ft tables for the food to be set-up on. If needed, tables can be rented for $10/each. “Hot Passes” (Hot Tray Service) Available Including Hot Appetizers, Quesadillas, Smoothies, Mini Gourmet Sandwiches, Grilled Vegetables, Pot Stickers, Taquitos, Spanakopita, Grilled Sausages, Cheese & Cracker Platter, Fresh Berry Parfaits, Empanadas, Etc. Choices will be varied for crew to enjoy an assortment of Items when there are multiple shoot days. Special requests are welcomed. PLEASE NOTE: We will arrive 30-45 minutes prior to your service time for each service. If you have any special requests or dietary restrictions please let us know 48 hours prior to service. Tables are not included. You will need to provide 3- 6ft tables for the food to be set-up on. If needed, tables can be rented for $10/each. Please provide an ice chest for drop-off crafty, or one can be purchased at an additional fee.